Someone suggested starting an ATX scooter tag game, so I figured I'd get the ball rolling. OK, OK, there's not an actual photo here YET but I'm going to copy some rules in and if someone wants to get a photo in before I do, that's great...I love a challenge! * The boundaries are within Travis County, TX. *ADDED: if the tagger does not post a new photo within 48 hours, anyone may hijack the tag and start a new photo. 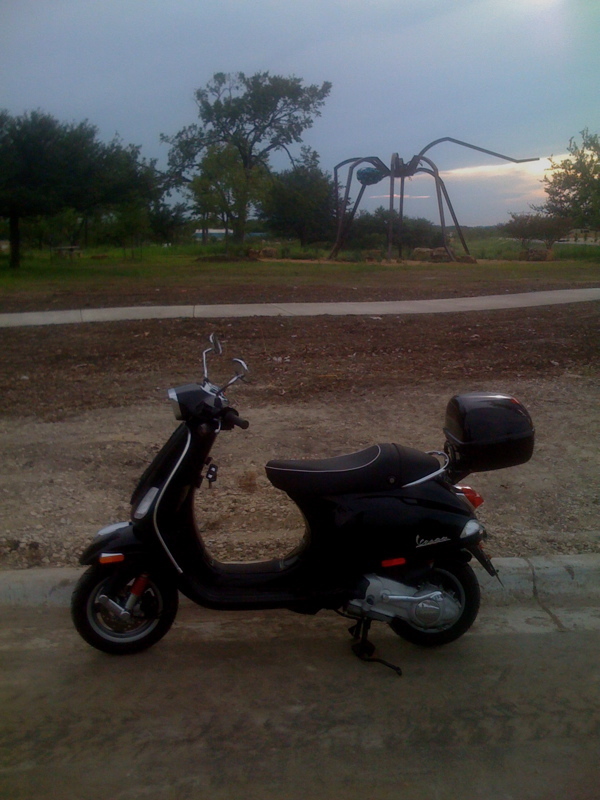 OK, I stayed up this morning after working all night, got my scoot and ran out to take a photo to put up. Now, I'm trying to get it downloaded into my computer and all of a sudden, my camera won't interface with the computer (it's always been fine before). I'm so frustrated! I think it may be the cable, but I really don't know. Doing all I can, and if that doesn't work, I'll probably go buy a new camera. Also first photo of Puddin' on the board! 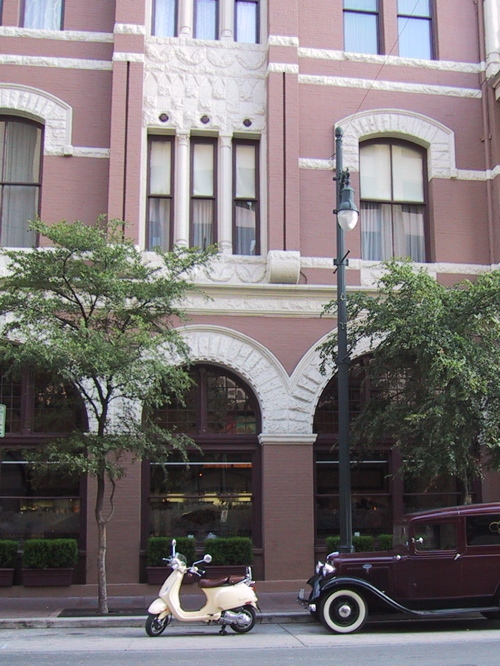 1886 Cafe & Bakery at the Driskill Hotel. Here's another easy one for everyone. I'll play a bit after I get my helmet and license. Helmet's good! License is better. I figured you weren't ready to join in, but definitely looking forward to it!!! I have a bunch of ideas, so I hope I get to use them. Oh and I know where the last tag is from darn!!!! and it is only a 5 minute drive from my work. 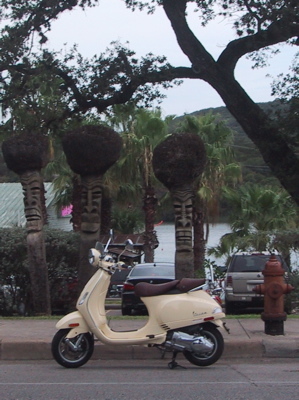 Could I take a picture of a picture of my scooter in front of it? Maybe you could do some really good photoshop editing...LOL. I still haven't had a chance to get over there! Dang! Fish tacos sound kinda good, too. So it hasn't rained here in forever and now that I'm going to go take the photo(s)...oh look! RAIN! Someone has to go get it. It will be pretty sad if I am the one who gets it at the end of the month. I'm just not one to deliberately ride in the rain. I think it'll be over in a while and I'll have a chance to zip over. Better believe me when I say I will not ride my scooter when it is wet out. If I am at work I'll ride the bus home before I risk that so I am all for being safe. 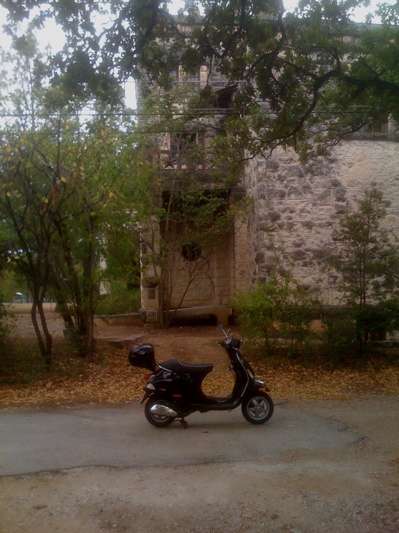 When I had my GTS, I got caught out at a Bouldin Creek Coffeehouse and had to ride home (at that time, I lived near the current photo in question) in a torrential downpour. It scared the crap out of me. I'm usually very careful about checking weather and forecasts so as not to get caught out. I've even taken leave from work to be able to get home before a storm. It is not only scary, but the rain actually hurts if you don't have on tons of clothes. Shouldn't this thread be in Rallies & Events with all the other scooter tag threads? It probably should...but... I don't know how to move it and since we're a smaller group on here than the CA people, I started it where I thought more Austinites would see it. Was that wrong? 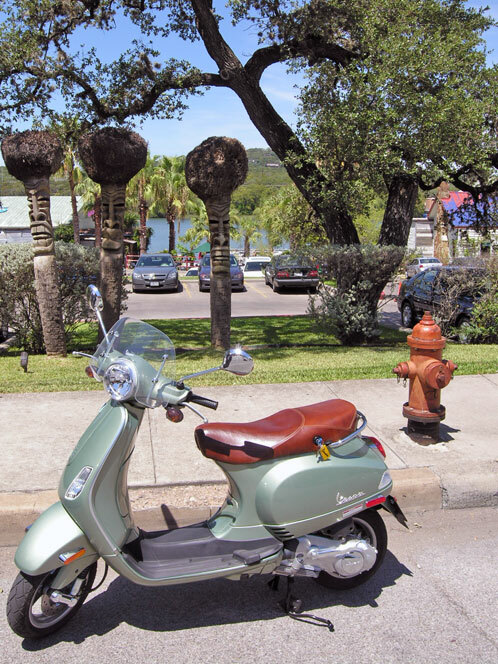 Austin is a fun place, with or without a scooter. It's growing like crazy, so you might not recognize it. The mods can move it for you. It is an activity, it belongs with its little thread friends. If we can keep the categories fairly clear, then people won't wonder where things go or where to find threads. Visibility is an issue for many threads. The California threads go for weeks without activity sometimes. The little exclamation point in the upper right corner is a moderator paging device. It will get them to come over but they won't bring you any more coffee. Get out and take more pictures of Austin. Thanks! I ended up going to another thread and emailing them from there. Learning is good! Gonna take a shower (it's my day off!) and hopefully go get the photos. The next one is likely more challenging. Uh oh let's see if I know it. I have only lived here for 3.5 years so some might stump me. I'm on my way out the door, looks like the rain is to the south. Woohoo! Here it is! Great cool weather outside, too!!! Way to go!. I love Hula Hut! I drive my boat there. It's fun and delicious, what more could you want??? Lucky you arriving by boat! They have a pretty decent motorcycle/scooter parking area, too. Next photo is taking a while to attach itself, but it's coming! and for your next challenge...!!! So, is anyone else from Austin going to participate (soon)? I'd hate for these tags to be solely between khaiku and myself. I have a hunch where this one is, but need to verify it. I will participate but do not have a helmet or my M-license yet so it might be Sept before I am active. I don't have a clue where this is but it looks cool. Please do persevere. I will play! I am desperately trying to figure out where this is. I've only been back in Austin for about six months after having been gone for 14 years! Darn I know where it is. Someone go get it! I'm looking for another hint. About to head home from work if I can figure it out and it's relativley near I am all over it. Excellent! Hike & Bike trail at the Mueller development off Manor Rd. Can't wait to see what you come up with!!! This one is not so easy, so I will start with some clues. This building is in a somewhat unlikely spot of what it is. 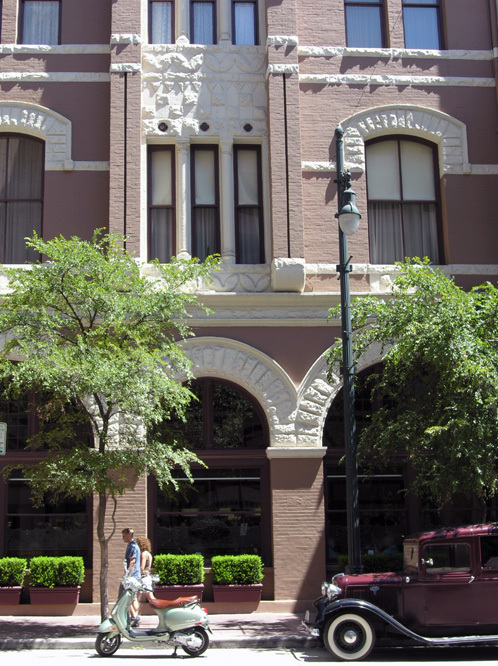 The shot is taken from the side of the building. 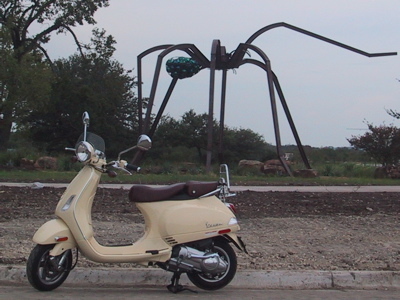 It is dedicated to objects somewhat like the spider.